When Does a Test End? - Satisfice, Inc. When Does a Test End? The short answer is: you never know for sure that a test has ended. 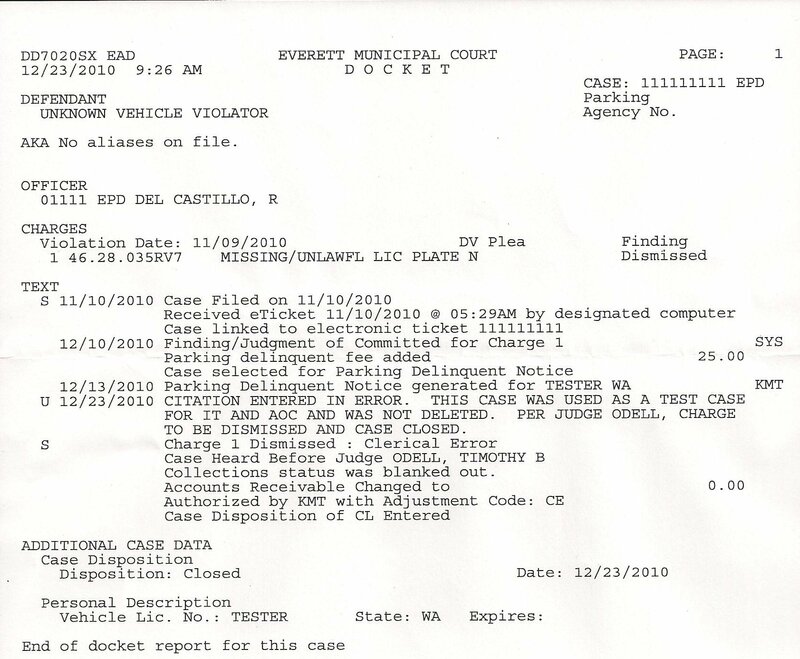 As you see, it seems that the city of Everett, which is located between Orcas Island (where I live) and Seattle (where I occasionally visit) felt that I owed them for a parking violation. 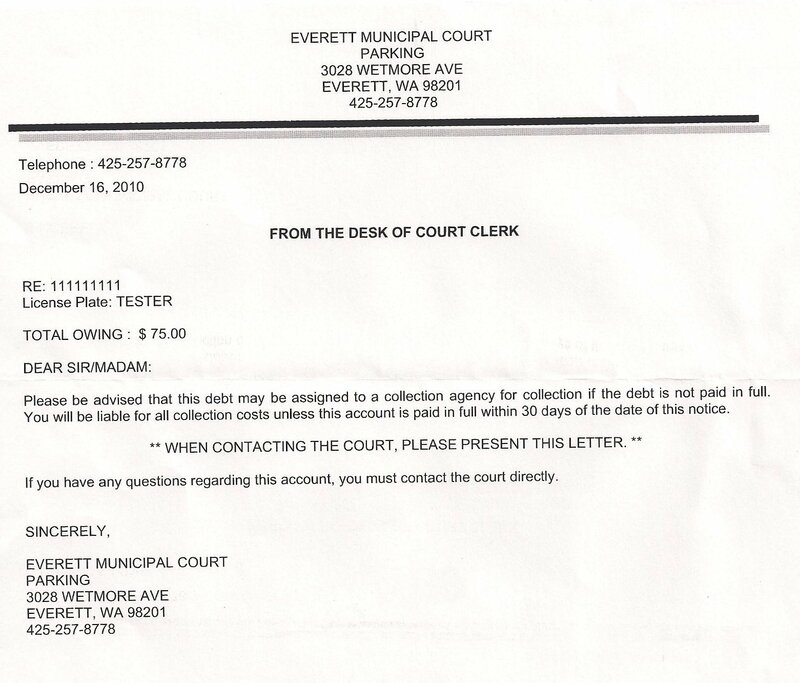 This is strange because I have never before parked in Everett, much less received a ticket there. A second reason this is strange is that the case number, apparently, is “111111111”. At first I thought this was a hoax, but the phone number and address is real. The envelope was sent from Livonia, Michigan, and that turns out to be where Alliance One Receivables Management, Inc. is based. They collect money on behalf of many local governments, so that makes sense. It all looked legitimate, except that I’m not guilty, and the case number is weird. Then it occurred to me that this may have been a TEST! Imagine a tester checking out the system. 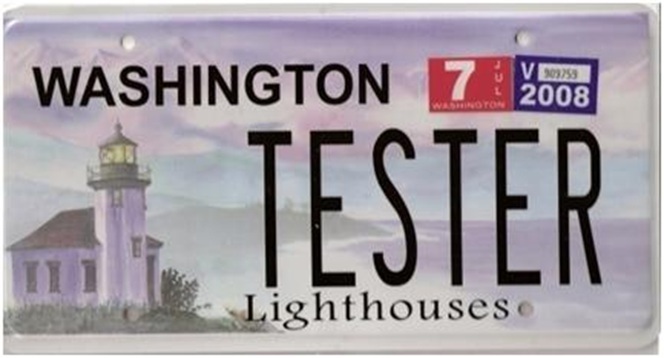 He might type “tester” for a license plate, not realizing (or not caring) that someone in Washington actually has that plate. He keys in a fake case number of “111111111” because that’s easy to type, and then he forgets to remove that test data from the database. “This can’t be right,” she said. “Could it be test data? Are you just starting to use Alliance One?” I asked. She told me I was probably right about it being a test, but that she would investigate and get back to me. So, there you have it. Someone ran a test on November 9th that did not conclude until December 23rd when it is stopped via a court order! Thank you, Judge Timothy B. Odell. I’m sure this will appear on an episode of Law and Order: Clerical Intent one of these days. Beware of testing on the production system. You never know when your test is over. Two weeks ago I blogged about another incident when testing on a production system http://thetesteye.com/blog/2010/12/the-helpful-model/ (when thinking of it, I think I told you this story over a dinner at SWET1). I take another lesson from this too: take care when you are copying to the live environment; check that your scripts to copy everything live do not include the live data tables – the schema maybe but not the actual data. As soon as we deploy to the live environment I do a quick test to make sure my test data has not inadvertently gone across too (before any scripts have run that do any data processing). Test data in the production environment, as we have seen, can cause a lot of wasted time and money and loss of reputation. Thanks James – a great story to tell in the future! I had also “interfered” with the tests on the production environment at least once. I created a hosting account at Inmotionhosting.com with username “testalways”. I was waiting to get the account activated, but it didn’t. After I called support they informed me that the accounts with username beginning with “test” are not being activated. They had good support that quickly fixed the issue. This name was stuck in my memory for a while: Ralph Tester. Also, while looking up for the article in Wikipedia, I found reference to The River Test in Hampshire, England. What a truly hilarious yes disturbing coincidence that you of all people would get the ticket from the “testing”. I was literally laughing so hard I can still barely breathe. I couldn’t agree more, in the value of humans for troubleshooting, and not just humans but intelligent humans that fluently speak english. Great story. It makes me wonder how many tests have resulted in parking tickets that actually got paid. Watch out if your license plate starts with “asdf”. That reminds me I made that mistake in my first testing job. I worked for a mortgage broker that hired some Foxpro experts to create mortgage processing software. She told me to test it because I had experience in processing mortgages. But I had no “instructions” and definitely no training. So I started creating accounts with all kinds of nasty data (outrageous numbers, etc., not “explicit”). Next thing I know their reports are all fronked. As a result, we created a test database. Oh the lessons learned from no guidance. At a recent I laughed at some of the test data. “Ali Mente” which would translate to “allmony”, besides that there might be someone out there called Ali Mente. You’ll never know. This did make me laugh! Wonderful story James & very good food for thought for everyone. I’ve seen a few mishaps like this in our workplace. Thankfully nothing so serious, just a few funnies that didn’t get removed. We don’t break software, we reveal *laws* about software that can be broken. What a great anecdote to share in future classes – and a relief it was so easily resolved. Hooray for competent humans! Sorting it out could have been quite a headache. Not quite as cool as the NOPLATE/NOTAG bug (http://www.snopes.com/autos/law/noplate.asp), but nice work anyway. Reminds me of the story of the woman from New England named None (no-nee) who had a vanity plate with her name. When she visited NYC for the first time, she was arrested and jailed as the biggest scofflaw ever–though she’d never even been in NY before. Turns out, tickets on all unlicensed cars had the license # filled in as NONE. I don’t remember the fines, but they were in the tens of thousands of dollars. I think she eventually got out of jail and didn’t have to pay. I hope so, anyway. Dang it! Now you’ve got me second guessing if I should name my kid “Tester”. Probably not a good idea I guess. The poor kid will probably be cursed with verbal corrections: “Did you say Chester?”, “NO, TESTER”, “Did you say Hester?”, “NO TESTER”. Excellent story James. And it made me laugh so much that you of all people would be the victim of this test. What I dont understand though, is what this eTicket system was supposed to do? Issue an eTicket that after lying around for 30 days is sent to court? You didnt receive the eTicket in any way before? In this case, the defendant reads “Unknown Vehicle Violator”. I am unsure if the term “violator” can be used before judgement is pronounced. Secondly, maybe they need US Laws to prosecute “test cases” 🙂 !!! After dancing around separation of live data, auditors and anyone involved in testing for the last five years, I shudder that in my industry this would have be prosecutable, in no uncertain terms. My father had no middle name. He was often told to enter “none” on forms in lieu of a middle name. Humans recognized this convention. Enter computerized records, and he started getting mail with “None” as his middle name. The computer programs not only weren’t designed to recognize the convention but they fixed the entry by capitalizing it. I am just trying to visualize ….wondering if you were not a tester what would have happenned next…..
Would you have just made the payment or still tried to reason, logic and get to the root of the problem ? Also makes me realize … State of ordinary human being is tough everywhere as they struggle to survive !! Interesting story; ……We need good testers ! This is awesome and wondering that how a tester is given a prod access, rather he/she must be provided with the dump of prod in QA env. Well now are you going to change your plate? Or you gonna waiting for the next application to be tested and next letter would on your way? 1) If testing in live enviroments (or whereever some data transfer might take place) then double (and triple if it’s late) check if you have deleted all the data. I missed about 10% of used testdata. 2) Know what system (and people using the system) does/is supposed to do with data. I had to explain why and how the letter came. If I hadn’t known the system from inside out, then it would have been way too much assuming. 3) Always use as real as possible and known data. What if the letter had gone to someone else who didn’t know about the product? This story reminds an incident I had with a vendor registry system of a major software provider. I received their invitation to register our company and product at their system. For some reason I could not get through the last step of their online registration system. I kept getting a generic error saying something like your request did not go through. I emailed them back about the problem but they did not see any error in their system. So I was asked to try it again as they were thinking it’s got to be a user error. After many going back and forth, they finally found out that it was my company name that was causing the problem: it has “test” in it and the developer apparently put in some special logic in the code for his/her testing purpose during development which got deployed to production environment. Luckily the developer did offer a way to bypass this logic and allowed their helpdesk to complete the registration for me. A wonderfull reaL llife example of what happens when testers test on live machines! Very good of you to just call! A reality of the testing strategy indeed. Once i used to test by using the email address ‘xyz@email.com’ . But few days back one of my colleagues showed me that there is a domain ‘www.email.com’. So, if there be a user using this email address, how many emails he/she got from my system. Happened to me a few years ago. I received a notice that I owed Bloomington, IN $72.00 for a parking violation. My vanity tag was Test 1. I had not been in Bloomington for more than ten years. Took a lot of phone calls but finally the fact that Test 1 was used in their test scenario was identified and the fine revoked. Even we are also facing same problem after making our system live. During testing we usually enter those things which are convenient for us but sometimes it creates such issues. I think, thats why live data is most preferable during testing even on testing server.